Boston Hassle has perhaps the definitive rundown of Shake, complete with deep dive into some of the buried treasures and varied vibes. Locals know. This one surprised us: One of you schemers called in to WBEZ Chicago’s Sound Opinions podcast to talk about ‘Shake’ as a Buried Treasure. Click the link or listen below. After spreading some ink to hype the lead single and title track, If It’s Too Loud returns with a review that calls ‘Shake’ a record that ‘shatters music snob beliefs” about mixing irresistible hooks and irrepressible savagery. Read on, pilgrim, read on. Gray sits down with Michael Marotta to talk about how ‘Shake’ represents the evolution of Salem Wolves. Mayhem ensues. Check it out on Vanyaland. 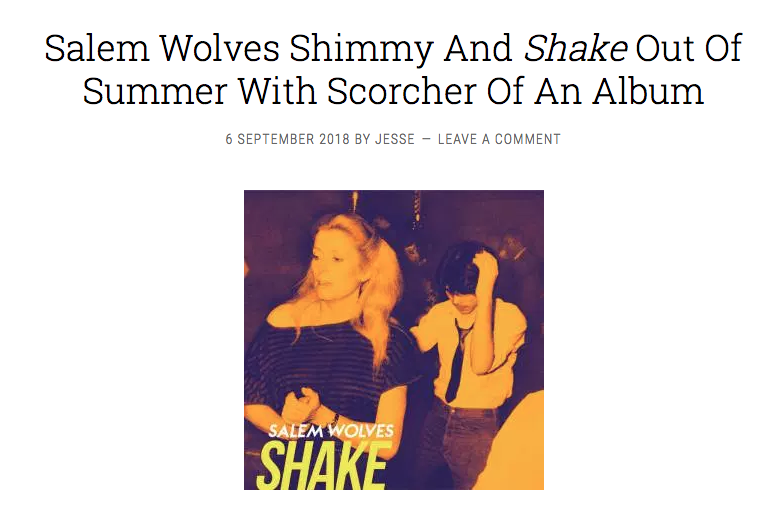 Salem Wolves new record ‘Shake’ has arrived. Listen to it now on Bandcamp, iTunes and Spotify. New music... MONDAY? Just roll with it. BearTone Studio invited us to take part in a locals only 80s tribute record. One day, one song. To honor the recently departed power pop giant Pat Dinizio, we picked The Smithereens' 1986 hit "Blood and Roses." Rev the engine, pop in this cassingle and try to live when you don't belong.